Switchboard Pro provides a graphical overview of all incoming calls to help you manage your phone system. Once you assign a Switchboard Pro to a user profile, a switchboard receptionist can route callers right from the desktop. Switchboard Pro is an optional feature that can be purchased separately. To configure a switchboard, you must name the switchboard and assign a user profile. If you are a Configuration Manager administrator, you must also enable a user to access Switchboard Pro. 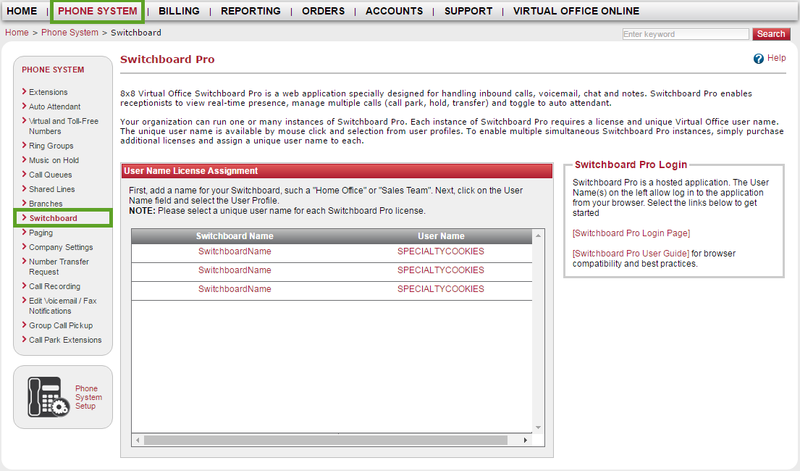 Note: To configure Switchboard Pro, you must be a phone system administrator with access to Switchboard Pro settings. As an administrator with access to Configuration Manager, you must enable a user to access Switchboard Pro, and assign them to answer calls for the desired company location. In the main page of Configuration Manager, click Users. Click Create User to create a new user. Click the More Options icon next to an existing user, and select Edit. Under Advanced Settings > Switchboard, enable user access to Switchboard Pro, and save. The user receives an email notification with information on how to log in to Switchboard Pro. In the main page of Configuration Manager, click Switchboard. Click Add greeting to assign a new switchboard receptionist. In the window that pops up, assign the desired user, enter their associated greeting, and save. The selected user and greeting appear in the list of available switchboard receptionists. Click the Main Menu icon, and select Sites to open a list of your company's locations; you must now assign your receptionist to a site. This allows you to manage your receptionist greetings by site to offer a tailored experience for callers ("Welcome to AcmeJets San Francisco; how may I help you?"). Click Create Site to create a new site. Click the More Options icon next to an existing site, and select Edit. Under Voice Service Settings, enter a Receptionist to receive calls for the specified site, and save. As an administrator with access to Account Manager, you must configure a switchboard and assign the desired user as a receptionist. In Account Manager, click Phone System in the top navigation bar. Under the Phone System menu, click Switchboard. On Switchboard Users, click View to open the Switchboard Pro page. Click under the Switchboard Name column to edit the name of the desired switchboard. Enter a name, and click Edit. Click under the User Name column for the desired switchboard. Click Select next to the user profile you want to assign the switchboard to. The switchboard is now configured with a name and user profile.